Here are some photos from a nighttime beach walk we took a couple of weeks ago. Ever wonder what diving ducks do underwater? In the photo below you can see a duck excavation, created by foraging a surf scoter, white wing, or other clam-eating duck. In the winter the tideflats are covered with these pits, and the hungry ducks are one reason we always put nets over areas of the beach where we've spread clam seed. We also found a spotted dorid hanging out. The most common nudibranch on our beach is the yellow monterey dorid, so finding this spotted guy was a treat. 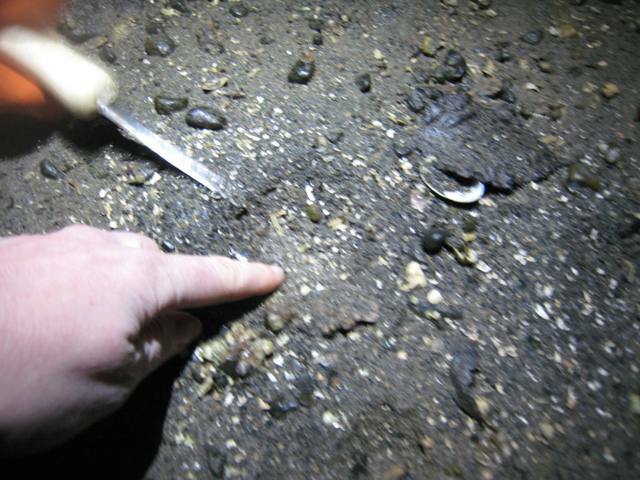 One of the difficulties of farming oysters is that during the winter you rarely get a good chance to inspect your crop... it's only ever exposed at night. So Adam frequently has to go on beach walks to figure out how the gear is holding up, whether or not the seed has been washed off the drop-off, or to make sure that starfish aren't sucking all the tumbled oysters dry. Certain areas of the beach act like oyster back eddies, as in the photo below. That's a bunch of last year's seed piled up on top of each other in a slough. And here's a starfish, taking his cut of the tumble farm production. Remember that starfish can actually evert their stomach and digest their prey remotely. That means they don't actually have to get in the cage with the oysters in order to eat them... they can do it all through the mesh. Lovely. And here's a big, wild Olympia oyster riding around on a Pacific oyster shell.